When I was pregnant with my first child I learned about something called “productive pain”. “Labor pains are different. It is PRODUCTIVE pain,” some well-meaning, good intentioned birthing coach told me. And, somehow this acknowledgment was supposed to make the pain more tolerable. As if in the moment of unbearable, gut-wrenching pain telling myself: “Now, remember, Emily. This pain is PRODUCTIVE” was going to help me feel better. I am here to tell you that is bull****. I mean someone out there may want to argue with me on this statement. That is fine. Go ahead. I am sure the mental shift to recognizing pain as “productive” was helpful for you. For me, it still hurt like hell. Mentally reframing the pain as “productive” did NOTHING for me in the moment of contractions. Do you know what did help? 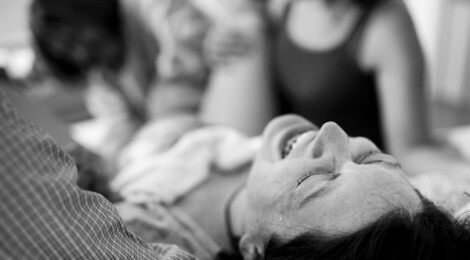 When I was giving birth naturally without any pain relievers (if you detect a tone of pride here…yep…totally there) to my second daughter…all nine pounds four ounces of her…I figured out that screaming made the pain more tolerable. So that’s what I did. We were in the Czech Republic and my birthing attendants didn’t speak English anyway and I was pretty sure I would never see them again. If I contributed to the notion of Americans being dramatic, loud, uncouth, and wimpy…so be it. 9 pounds 4 ounces, ya’ll. It’s my birth and it’s my pain and I will scream if I want to. Friend, our world has lots of ideas for how to go through pain…how to grieve…how to experience and give birth. It is your birth (or grief or pain or loss or hard time) and you can scream if you want to. And, in that screaming and yelling and crying out, guess what? It IS productive. Whether it feels like it or not. But, that knowledge does NOT make it feel any better. It is still going to hurt like hell. So here is what I want you to do. I want you to get up every day. I want you to put one foot in front of the other and trust that going THROUGH the pain will lead you to the OTHER SIDE of the pain. I want you to do things you know that are good and healthy for you…even when you don’t feel like it. Even when you feel like you are a machine on autopilot. I want you be intentional and reach out to a few people you trust on a regular basis…even when you feel vulnerable and stupid and like a bother. I want you to eat. Sleep. I want you to distract yourself when you need to. Watch a favorite movie. Netflix binging is not always a bad thing. I want you to practice being firm with yourself when negative thoughts run amuck. And, I want you to give yourself room to scream. Yell. Cry out. It IS productive. You ARE moving through a tunnel towards light. Not sure I know how to cry or scream without the overwhelming sense of guilt or shame; but, I love how you acknowledge that you really can’t just reason your way out of pain. Lol even know I often try too. Kelli, praying we all give ourselves a little more room for crying, screaming and feeling our way through pain…without the guilt or shame! Me, too, friend. Me, too. Emily, I loved this post and your description of birth. Lorinda was born in CA with no family around excep Charlie and Stephanie. She weighed 9lbs 3ozs and a natural birth. Wish I had known it was okay to scream. It would have made me happier, for sure. Emily, I loved it (despite the part I don’t identify with literally, I think I get the jist). Random thought. I would love to see your brain and heart tackle the idea of a theology of lament. Perhaps hidden in the experience of lament in scripture is the pathway to worship and healing. Anyway, loved it. You and Jonathan always inspire!